Children with autism spectrum disorder (ASD) may have issues effectively processing sensory information and may perceive sensation differently. For example, a child may perceive touch sensation as painful or immediately become startled when touched. Some children are extremely sensitive to noises such as the sound of a toilet flushing. A child’s sensory needs and way of processing sensory information from their surrounding environment is completely different for each child. Helping a child with sensory- related issues always needs to be done with an individualized approach because each child is unique and experiences something different. However, there are some general strategies and activities that are calming and helpful. For example, deep pressure (the feeling of a hug or being compressed/ held tightly) can be very calming and organizing. It’s the same reason why swaddling a baby can help him/her sleep or stop crying. 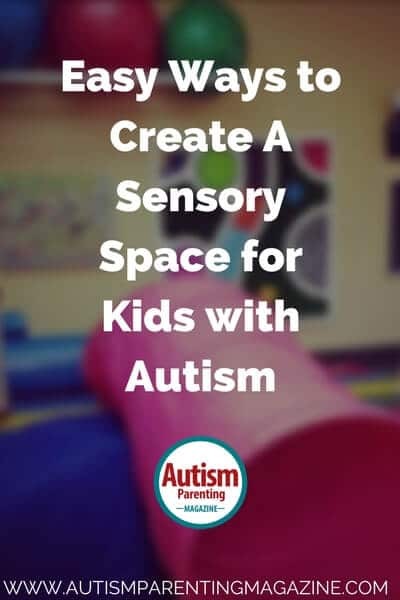 There are many therapy tools and items used to help children on the autism spectrum with sensory processing so they can function more independently in their everyday lives. Things like and compression vests were invented to help increase body awareness and produce a calming effect. As you will see, incorporating therapeutic items and calming activities is possible to do in your own home with the use of everyday items. A sensory gym in a setting such as a pediatric therapy clinic (as shown in the photo), may have various kinds of therapy swings, trampolines, ball pits, crash pads, barrels, tunnels, mats, rock walls, ladders, ramps…the list goes on. A sensory room, such as Snoezelen® rooms, can have high-tech lighting and fiber optics, projectors, water beds, bubble tubes and wall panels. The purpose of these rooms is to provide a relaxed atmosphere where the person is surrounded by pleasant sensations (unique tactile experiences, relaxing aromas, interesting light effects). Instead of installing expensive swings, your child can get his or her vestibular stimulation from bouncing on an exercise ball, sitting in a rocking chair, or jumping on a mini trampoline. You can even include a light table into your sensory space. Check out this blog post on how to make an inexpensive DIY light table. I would recommend dividing them up into little bins or individual storage containers. If you have too many items lying around, it can be visually over-stimulating, and then your child becomes uninterested. Instead, keep the unused toy bins out of sight, and introduce selected toys one at a time into your child’s sensory space. Rotate the bins as needed. This way your child won’t get bored (or overstimulated by a mountain of items). Why not create your own? A very simple Do-It-Yourself (DIY) solution is to take a large zip-up duvet cover and stuff it with pillows, blankets, large stuffed, animals, etc. Zip it up, and let your child jump and crash into it. *Note: Crashing into a crash pad, jumping, climbing, crawling, pushing, pulling, lifting objects, or any sort of weight bearing activity is great for providing proprioceptive input. What’s proprioception? The sensations from our joints and muscles that underlie body awareness. When we give our body this type of sensory input, it can help improve body awareness and is very organizing and calming for the body. You don’t need a fancy machine that sprays out various aromas. You can simply take some essential oils, dab it on a cotton ball, and let your child smell it. Playing with scented play doughs is also a way to incorporate some “aromatherapy” into your sensory space! Lavender scent is calming and helps with relaxation. A cost-effective option for building a private “snuggle space” for deep pressure is taking a play tent or even a blow up kiddie pool and filling it with blankets and lots of stuffed animals. Let your child burrow into all the fluff! Another option is to roll your child up into a blanket (like a little burrito) or let him/ her crawl under comforters and heavy blankets. You can create your own textured wall or board using household items. I’ve even seen a wall with old CDs glued to it (smooth, shiny side up), which makes for interesting visual stimulation. Check out Pinterest for more DIY tactile wall ideas. Instead of an expensive massage mat or vibrating equipment, a simple hand-held massager can provide your child with vibration sensations. A vibration massage can be very organizing and alerting for a child with a low arousal level. Vibration gives a child that extra sensory information to “wake up” their muscles. It can be very therapeutic and calming for a child who is a “seeker” and gives them the sensory input they crave. You can give your child a vibration massage by turning it on and rolling it up and down your child’s back, arms and legs. If your child does not like the sensation of the vibrations, never force it. Instead, you can try keeping it powered “OFF” and just use it to give a gentle rolling massage. Homedics makes a wonderful massager that I often use with my pediatric clients. If you’re a Sensory TheraPLAY Box subscriber, you’re covered because the Homedics massager was included in the January box. If not, you can find these massagers here and here. You don’t need a state-of-the-art sound system. A simple stereo or inexpensive mini sound dock to play music over is a wonderful option. Or, simply play some songs on your phone to have as background noise in your sensory space. Music can change the way we feel. Songs with a steady beat have shown to be calming and effective in lowering anxiety. Our bodies respond and “sync up” to the music. Native American, Celtic, Indian stringed instruments, drums, and flutes are excellent at relaxing the mind. Nature sounds, and sounds of rain, light jazz, classical, and easy listening music are very calming as well. Best of luck to everyone incorporating sensory activities and items into their homes! As you introduce different sensory items, you will learn more about what your child’s sensory preferences are by observing what they gravitate to and enjoy. Many times, seeing what helps a child self regulate is a matter of trial and error and pure exploration. I just wanna know if my son can box? Like hand to hand boxing, the sport?